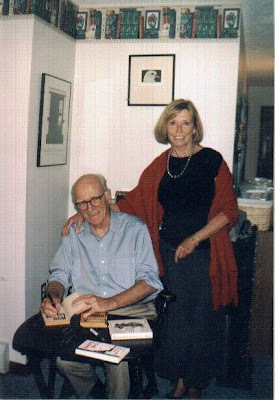 We were very fortunate three summers ago to have an author event with Donald E. Westlake, aka Richard Stark, Tucker Coe, and many other pseudonyms. Westlake’s wife Abby Adams Westlake was also in attendance and she is also an author. They signed books during the author event and Donald was so gracious to sign my personal collection of his books. I have to admit my favorite Westlake books are from his Richard Stark and Tucker Coe series and his early Westlake titles under his own name. The only books that Donald wouldn’t sign were three books that one would categorize as sleaze novels that he wrote early in his career to raise money for his family. He chuckled when I showed him the three paperbacks I had in my collection. We were quite hearbroken when we found out last December that Westlake had passed away. We remembered the lovely evening that we spent with the Westlakes and our customers. We still have some signed books from the event and they are treasures for customers who purchase them. This week Hard Case Crime announced that next April it will publish MEMORY, a novel that Westlake originally wrote in the early 1960s. It was never published because Westlake’s literary agent couldn’t sell the book at that time, according to his long-time friend Lawrence Block. It is our hope at Kingdom Books that the Westlake family finds a few more unpublished manuscripts in Donald’s file. Run to your local bookstore and purchase a copy of Stieg Larson’s book The Girl With the Dragon Tattoo. I consider the book to be one of the 20 best mystery novels of all time. Larson, who passed away in 2004, handed in three manuscripts before his death and the second book in the series, The Girl Who Played With Fire, will be released soon. For collectors, first editions, first printings of The Girl With the Dragon Tattoo are uncommon in fine condition. Kingdom Books is very fortunate to have the Edgar Award-winning author Eliot Pattison appear on August 2, 2009 at 7 pm. Eliot makes less than a handful of author events in any given year and thus his appearance at our tiny shop last year was a delight to the folks who came to meet and hear him. On a personal note, I have given a number of copies of The Skull Mantra to mystery friends who read the book and became fans and readers of the entire Inspector Shan series. The Inspector Shan series is published by SOHO PRESS, which also publishes some of our favorite crime and detection authors: Leighton Gage, Garry Disher, Martin Limón, James R. Benn, Matt Beynon Reese, Colin Cotterill, and Peter Lovesey. Kingdom Books has a full selection of Eliot Pattison's books. 1.The Skull Mantra (1999) Edgar Award from the Mystery Writer’s of America for the best first novel. A finalist for the prestigious British Golden Dagger Award for Best First Novel. On Tuesday, July 21, The Poetry & Prose Series of the English Department will present Rigoberto Gonzalez at a reading of his work at 4:00 pm in Sanborn Library, Sanborn House at Dartmouth College. Rigoberto Gonzalez is an associate professor for the MFA program at Rutgers University and this summer's Frost Place Resident Poet. His poetry book Other Fugitives and Other Strangers won the 2008 Poetry Center Book Award. His young adult novel The Mariposa Club was published this year by Alyson Publications and he is the editor of Sunstones: A Camino del Sol Latino Literary Series due out in 2010 by the University of Arizona Press. He is a contributing editor to Poets & Writers Magazine and on the Board of Directors for the National Book Critics Circle since 2003. A small reception will be held after the reading in the Poetry Room. This event is free and open to the public. The Hangman framing shop in Hardwick opens its Celebration of Art and Poetry on Sunday July 19, with poets reading from 2 to 4 pm: Cora Brooks, Phyllis Larrabee, Geoff Hewitt, David Budbill, Martha Zweig, and Peggy Sapphire. More info HERE from the Seven Days calendar. The author of the deliciously funny Bubbles Yablonsky mystery series (BUBBLES UNBOUND, BUBBLES IN TROUBLE, and more) switched genres a few years back, dipping into romance braided with girlfriend honesty and humor. 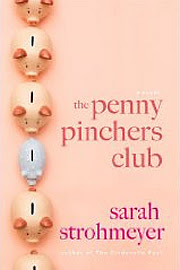 Sarah Strohmeyer will sign copies of her newly released "summer fun" novel, THE PENNY PINCHERS CLUB, at Bear Pond Books in Montpelier, VT, on Tuesday July 7 at 7 p.m. -- and has just announced that her earlier volume, THE CINDERELLA PACT, will be a 2010 film on the Lifetime Movie Channel, starring Poppy Montgomery (best known for her lead role in the TV series "Without a Trace"). Brava! This Vermont author knows how to change with the times, and we're thrilled to see her success. Bubbles would have loved it, too. Thanks to the Frost Place of Franconia, New Hampshire, which selected him as this summer's Resident Poet, an outstanding young poets has left New York City for the summer and will read with local favorite Garret Keizer next week at one of Vermont's classic buildings, South Congregational Church in St. Johnsbury, at 7 p.m. on July 15: Rigoberto Gonazález. This urban writer and teacher confessed it had been seven years since he'd last driven a car, but he made it safely to the old white farmhouse where Robert Frost lived from 1915 to 1920, the most important turning point of his writing career. When the Frost Place offers a summer residency, its search committee tries to find a poet in roughly the same career position -- a couple of books in print and the potential for amazing growth. González is already known as an author adept in several fields: In addition to his poetry, he has written children's books, memoir, and a wide body of critical work. But for today's reading up on the mountain, he read exclusively from his first collection of poetry, SO OFTEN THE PITCHER GOES TO WATER UNTIL IT BREAKS -- a book he considers his love letter to Michoacán, Mexico, where he grew up. He selected narrative poems flooded with imagery, starting with "The Flight South of the Monarch Butterflies" and ending with the delicious "Doña Maria Greets Her Comadre Doña Luna at the Balcony Window" and a poem he has shared with schoolchilden, "The Man Who Gives You Nightmares." Son and grandson of migrant farm workers, González came to America at age ten with his parents, and he recalls that he had "one day to learn the English language, because my parents could not in any way negotiate these letters and words." Despite their linguistic handicap, however, his parents came to contribute to this country. González carries on their gifts as he shares his work. During his residency at The Frost Place, he hopes to rediscover in English the Robert Frost poems that he memorized as a child, in Spanish, and perhaps re-translate them in the process. Surrounded by old friends and new on the mountain today, González was relieved to discover that he felt less alien than he expected, and very much welcomed to northern New England. For an opportunity to add to that welcome, why not attend his reading next week at South Congregational Church, on Main Street, a block south of the Athenaeum -- and help this gracious poet find the roots that Frost once discovered in this cool, green landscape among its varied people. It is the season of thunderstorms. Half a dozen times today, the weather alarm in the guest bedroom shrilled its "attention" signal, begging us to turn on the radio. But as long as I know to protect the vulnerable underbellies of our computers, I'd rather simply regard the bank of weather as it hovers across the valley, and wait for the flashes and rumbles. An elegant new offering -- the third -- from Andrew Miller-Brown's PLOWBOY PRESS proves that a narrative of storm is not always the best net for capturing its power and resonance. Laid out in crisp Futura type on well-shaped pages of Mohawk Superfine, 5.75 by 9.25 inches (about 15 by 23 cm) and bound by hand in Fabriano Miliani Ingres, the book REPERCUSSION is from the pen and mind of Timothy Barcomb. Before I go any further, let me explain why I've described the fabrication of the book in this way. Dave and I enjoy introducing fine press work to people who haven't yet thought about a book as an item of beauty and complexity. It's another dimension of the experience of words: As children we savor words spoken and heard, in school we learn to seek meaning from words printed and read aloud, and in maturity we braid our life experiences into the meaning on the pages. But to hold a book that's been designed for its own physical soul, as well as for its contents, is a delight. And in its second half, the human beneath the storm clouds becomes ever more present. Each poem that follows braids both human and landscape. Often the phrases ripple with the storm's impact: "It could be any discovered nerve /standing them in the middle of the bed // half awake and screaming" or "echo of pebbles // cracked under the sole, / tripped over broken cement." Noises crackle against textures; the shapes of words on the tongue and in the mind's eye dance with the simple layouts on the pages. 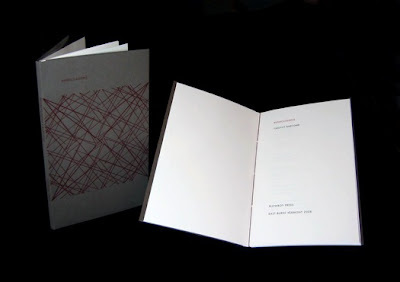 I've borrowed a photo from the Plowboy Press web site to show you the start of this exploration, and I wish I could transport the sensation of the heavy paper wrap (covers), the geometric precision of the design, the quiet insistence of the sequence of carefully positioned words and stanzas. I can't tell you a lot about Barcomb yet, other than what the poems reveal, and the small but notable fact that while at Johnson State College (Vermont), he was a poetry editor for the Gihon River Review. Then again -- perhaps you'll want to purchase one of the 150 copies that Miller-Brown crafted and Barcomb signed. Order directly from www.PlowboyPress.com. Calendar Alert: July 2, Dara Wier, Lesle Lewis, Elizabeth Hughey, all in Shelburne Falls, Mass. Thursday, July 2, at 7:30 p.m., award winning poet Dara Wier, with Lesle Lewis and Elizabeth Hughey will be reading as part of the Collected Poets Series. Mocha Maya's, 47 Bridge St., Shelburne Falls, MA. 413-624-6292. Suggested donation $2 - $5. For more info, see www.collectedpoets.com or www.mochamayas.com. Writers at the University of Massachusetts Amherst, and along with Emily and Guy Pettit, publisher and editor for Factory Hollow Press. Forthcoming in the fall of 2009 is Selected Poems. Lesle Lewis' books include Small Boat (winner of the 2002 Iowa Poetry Prize) and Landscapes I & II (Alice James Books 2006). She's had poems appear in American Letters and Commentary, Green Mountains Review, Barrow Street, Pool, The Hollins Critic, The Massachusetts Review, and Jubilat, among many others. Lesle teaches at Landmark College in Putney, Vermont, and lives in Alstead, New Hampshire. Elizabeth Hughey is the author of Sunday Houses the Sunday House, which won the 2006 Iowa Poetry Prize. She lives with her husband and son in Birmingham, Alabama. Long before we become skilled poets (if we do), most of us write love poems. We learn them by heart, write them down, then create our own -- my mother taught me "Roses are red, violets are blue, sugar is sweet, and I love you" before I could read, and she penned it at the front of an autograph book that she gave me to use. Sadly, the era of autograph books had already passed, and I don't think anyone other than relatives ever wrote in the book for me. I lost it when my house burned. Loss and love are so often linked that love songs are just as often songs of yearning for someone who's vanished from our lives. Love poetry straddles the same duality. Elizabeth Bishop's "One Art" asserts that the poet will master the loss of the beloved, although it is, for the moment at least, "disaster." But what is the poetry of unmasterable disasters? and he has been here ever since. This poem has already spread, in its entirety, over many web sites and blogs; it is offered by Poets.org as a "poem for tragedy and grief" and will enter anthologies, no doubt. But the force of it is not alone in the collection. "Homicide Detective" provides an example of how someone who already understands the unending horror of murder can speak to what a family member actually needs. "Ant," a tiny eight-line poem in two stanzas, plays from Bonanno's daughter's nickname, LadyBug (Guatemalan by heritage, the daughter was Leidy, pronounced "lady"): It provides another insect, one with "rosary-bead parts," and points to what cannot be seen in an afterlife. Then again, life after a child's murder is always and only "afterlife," life defined by existing after a horrendous trauma, an unpardonable disaster. What strikes me especially in this collection -- I hope you will read it, so I'm not going to quote the poems at length; you want to discover them in sequence, I promise -- is that these are not my mother's poems. They are the work of an accomplished poet who has not "mined the past for something to write about" but rather meets the present with the tools of a skilled wordsmith. A parallel can be found in Brian Turner's HERE, BULLET (also from Alice James Books). Turner earned his MFA in writing, then enlisted and fought in Afghanistan and Iraq. He did more than survive, more than witness the deaths of friends and comrades and children and enemies. He led men into, and often through, the Valley of the Shadow of Death. (Doing this, he felt, demanded that he hide his poem-writing from his men, lest they assume he was lacking in the masculine force needed to direct their battles and survival.) The cleanly pruned and intense poems of Turner's collection are evidence of how valuable is it to be a poet first -- before coping with disaster. Bonanno's collection shows the same.